Pia Interlandi is a designer who creates garments for the grave. Her clothes are designed to make it easy for people to dress the bodies of their loved ones in a way that is dignified and appropriate for burial. 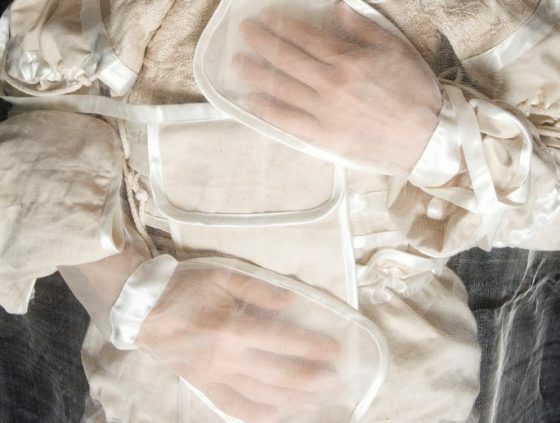 Interlandi’s funerary garments are fully biodegradable, and help the body to decompose more rapidly. Roman Road Journal asked her some questions about the theory behind her practice and her strangely beautiful designs. RRJ Editorial: What first drew you to the idea of making funerary garments? Pia Interlandi: I was always interested in clothing that was about transience, fragility, ephemerality, and in turn mortality, but it wasn’t until my Nonno (my paternal, Italian, grandfather) died and I dressed him for his funeral that I really began to think about why and how we dress the dead, in a real and literal sense. The process of dressing him was so cathartic and profound, I really wondered why we weren’t all dressing our dead. But there were some challenges in getting him into his suit and shoes, which made me think, ‘how can we do this better?’ I began to wonder how we could use clothes to invite families to dress their deceased loved-one in a way that is physically easy, give that it is a process heavy with emotion. After that experience, I spent the next few years working on my PhD, and Garments for the Grave became my practice. 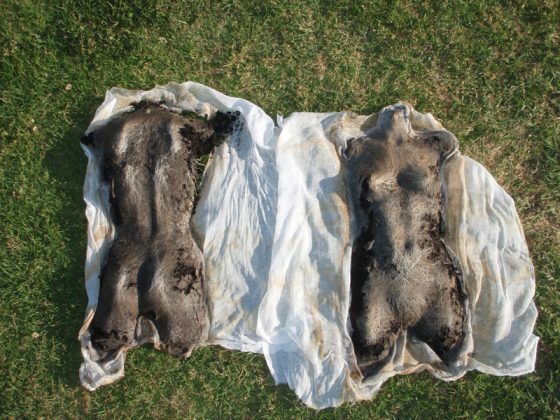 RRJ: Your designs are used to clothe the bodies of the dead in decomposable fabrics. Do you think the deliberately short lifespan of these garments helps the person who chooses them to come to terms with the transient nature of human lives? PI: The lifespan of clothing is a huge problem in the fashion industry in general. We use fabrics that are made from fibres that will outlive our own lives by hundreds of years (estimates of polyester decomposition sit at about 200 -1000 years). This could be seen as a mirror for how humans consider (or rather, don’t consider) their own mortality. By choosing to design with materials that decompose, which really isn’t difficult if you are using natural fibres (wool, silk, cotton, linen, hemp etc), I emphasise the idea that everything in and around the body should be able to be broken down into viable nutrients for the environment – that your death and decomposition is life for the next generation of organisms. A lot of my clients understand this idea of giving their bodies back, but for some it is just that the fabrics feel nice, and it is just an added bonus that they are biodegradable. RRJ: Many people in today’s Western society will never touch, dress or even see a dead body in their lives. What implications do you think this has for the way people deal with death emotionally? PI: Our current (Western) death practices are alarming; by not seeing a dead body we really have no idea what death looks like, and this then leaves room for our imaginations to run wild with scary and horrific ideas which don’t resemble the reality. I thought I knew what to expect when I saw my grandfather’s body (I’d seen Six Feet Under and a bunch of CSI-type programmes) but I wasn’t prepared for the utter stillness of him. Spending time with his body was critical to understanding that ‘he’ wasn’t in there anymore, and thus being able to bid farewell to the physical vessel he inhabited during his life was easier. Simply viewing an embalmed body in a coffin for 15 minutes isn’t enough. Being able to care for him through dressing him was transformational in my own understanding of death. I see this now in my practice constantly, where families are scared to come into a dressing, but through guiding them with transparency and gentleness, and time, they walk out feeling so grateful for having spent those moments with their person, and are often then ‘ready’ to have the funeral. To simply go from death to funeral, hospital to cemetery is too quick. Those who are primarily affected by the death become event planners, and are generally so numbed by the shock of the death (even a long drawn out death can still feel like a shock when it actually occurs) that they don’t even remember the funeral, let alone receive the emotional benefits of experiencing it. When we dress someone, having that incredibly intimate and personal time with the person who has died, shifts something. I often see that these living individuals come out stronger, to the point where they are the ones who stand up at the funeral and give the eulogy, who carry the coffin, and who then have the capacity to absorb the love from the community who come to bid farewell. They don’t leave funerals feeling empty, but feeling whole. RRJ: Most of your grave garments include a veil that allows for a softer transition when saying goodbye to the body. Veils have a long association with death (the phrase “beyond the veil”, for example), but they are also associated with marriage. Do you see a connection? PI: Yes, of course! But while marriage isn’t a certainty within a lifetime, I see the only true mirror of the final veil or wrapping as being that found in birth. Within moments of emerging from our mothers’ bodies we are wrapped in a cloth, sometimes even before we reach her embrace. We are thereby wrapped into the culture of clothing, where fabric is our second skin, and is the skin in which we present ourselves to the world. The final veil, followed by burial or cremation, is the same process in reverse, whereby we are covered and then our bodies undone and returned to the earth. RRJ: Many of your garment designs are the result of extensive research into fabrics and the practical aspects of dressing the deceased. How important is this research process to your practice? Through research I’ve been able to create a design practice that is functional, individual and beautiful. I wouldn’t have been able to create the work I do if I hadn’t spent years engaged with testing, understanding, unpacking, responding to and reinterpreting the knowledge I’ve gained through those experiences. Each client, each family, and each unique experience continues to teach me how to improve, evolve and contribute to making death a profound, grateful and fitting end to life. Visit Pia Interlandi’s website here.